Super stoked that this is happening. 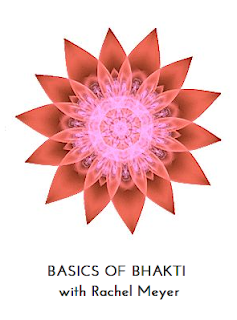 Next month at Flying Yoga, I'm devoting two whole afternoons to the study of bhakti philosophy and spirit. In other words, we get to hang out and talk about nerdy yoga stuff. Have you ever wondered what the heck "Bhakti Flow" is? And what makes it different from your usual Power Flow class, anyway? Join Rachel for this lighthearted 2-week immersion exploring the Basics of Bhakti. Together, we'll dive into the intertwining elements of sweat, breath, and song that combine to create a Bhakti Flow class. You can count on: an introduction to the basics of yoga philosophy, a down-to-earth overview of the Sutras and the Bhagavad Gita, a story- and art-infused guide to the major Hindu deities (like Hanuman, Ganesha, Shiva, Krishna, and more), and lots of great music, including rad tunes from bhakti-rich singers like Jai Uttal and MC Yogi. Naturally, we'll do a little of our own good strong chanting, too. Whether you're new to yoga or a long-time practitioner, this workshop is an excellent opportunity to learn a little more about the spirit behind the Bhakti yogic tradition, which is steeped in love and devotion. Bring your questions and your fears (if chanting makes you nervous, I'm talking to you! ), your passions and your curiosities. This is an ideal offering for folks who might be flirting with the idea of a teacher training or just want to know a little more about the music, spirit, and philosophy that embody the heart of Bhakti Flow. Jai!! Bringing the bhakti to Oak-town, baby! Sign up ahead of time here.